Maybe I missed it, but what are the boxes you have mounted to the sides behind the wheel well? smakee wrote: Maybe I missed it, but what are the boxes you have mounted to the sides behind the wheel well? Those are Dee Zee (DZ95P) plastic wheel well boxes. If I had to do it again, I'd go with the metal version and bolt clear through the sides, using carriage bolts with the flat heads inside the camper and nuts inside the box. I just finished a video "walkthrough" of Mr. Grumpy's Happy Companion. Have a look! G-Mac wrote: I just finished a video "walkthrough" of Mr. Grumpy's Happy Companion. Have a look! 1. I like the idea of a good comfortable mattress. Air mattresses and camp cots are not very comfortable to me. What brand/model is yours? 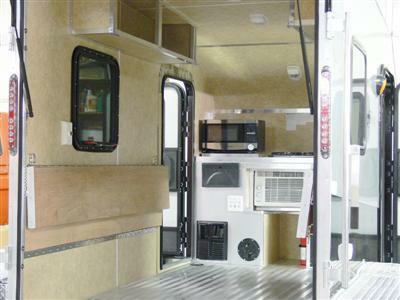 The specs on the camper are about 3/4" narrower than a full queen. Is it a full queen and just squeezed in? 2. The camper is prepped with an exterior plug for a Zamp solar kit. The manufacturer does not give any more info than that so I am guessing it is all wired to the battery and a Zamp kit would just be plug and play. Does yours have the Zamp connection? After some preliminary research, I see the Zamp kits are a bit pricey. Did you choose the Renogy kit because it was more affordable? What all was in the kit? Did the inside monitor come with it? 3. I like the dual Foxwing awnings. Can side panels be attached on all sides to create a sort of closed tent? Just wondering if they can offer enough privacy to simply change clothes rather than trying to get dressed inside the camper. I am short but not that short, lol. 4. I will also be towing mine with a lifted JKU. I am getting electric brakes and the lift kit on mine. You mentioned concerns about keeping tongue weight to a minimum. Even though these are light weight trailers, would a weight distribution hitch be something to consider? Glad you enjoyed the thread. Answers to your questions below! We bought a standard queen-sized memory foam mattress on sale from Mattress Firm for $400'ish. It was snug, but it does not induce any wrinkles or folds. I measured the width and then the mattress and it fit just fine. Our requirements were: Semi-firm, memory foam, as thin as we could find. Our mattress is abut 8" thick, but we have never hit our heads sitting up. Only while kneeling. For added convenience, regardless of the mattress you choose, check into Beddys. Beddys.com. We loved ours so much we bought one for the house as well! The "prep" is a joke. Yes, they install a connector that keeps you from drilling holes. No, it isn't connected to anything, nor is there a charge controller with the camper when you buy it. So the connector is all you get and the wires are just tied back. I went with the Renogy for price. They have a good reputation, but are not top-of-the-line. More than adequate for my little camper build and budget. I used an actual solar entry block and ran the wires that came with my Renogy solar kit. This allowed the wires to be as big as possible and the setup to be very efficient. The charge controller was a part of the kit. It goes between the panels and the battery and controls the charging from the panels. As for the "prepped connector": That connector is not proprietary and it is very easy to find at many auto stores and online. If you were going to hook up a small, portable panel (50 Watts or smaller) and want a simple way to connect the panel, then use the connector and connect the wires inside to your charge controller. In most cases, they could be connected in parallel with existing, permanent panels on the roof. Or you could buy a small portable kit and use the controller form it. There are many ways to skin that cat. The other option is to wire it so that you have an external outlet and use it for 12V accessories. That is what I did with mine. You need a little knowledge to do the wiring on any of this, but it is all pretty straight forward. 3. I like the dual Foxwing awnings. Can side panels be attached on all sides to create a sort of closed tent? Just wondering if they can offer enough privacy to simply change clothes rather than trying to get dressed inside the ca, but not rock hard, thin as we could findmper. I am short but not that short, lol. The panels can be put on ALL straight sides of the awning. That said, if you put up panels on all sides you would not have a good entry/exit point, as the open space left would be a bit narrow and those same spaces mean you don't have total privacy. The panels don't have a door in them and they are not convenient to "open" or pull back. A better option would be to get the add-a-room made by Rhinorack and would cost about the same as that many panels. It would also zip onto the awning (one straight section) and give a complete room for you to use and change in. Another (much cheaper) option is the popup changing room/shower/privacy room that you can find online. It is easy to carry, easy to setup and allows you about 2.5' x 2.5' of space that is tall enough to stand in and change. For us, it also doubles as the bathroom when we are dry-camping and take the port-a-potty. Search Amazon for "Pop-Up Privacy Tent". If you are not going to go through the effort to try shifting weight back like I did, then the weight-distributing hitch would certainly help prevent sag and make the whole setup drive level. Remember, the overall weight of the trailer is not what drives a weight-distributing hitch, it is the tongue weight vs what the vehicle can handle. At ~400#s, the Flyer can certainly benefit from a weight-distributing hitch. I have a .5" rake (higher in rear) on my JKU for just this reason. Between that and the lowered tongue weight (about 290# now), I sag about .75" in the rear when loaded. It's acceptable. I do wish I had brakes. I'm sure you will love having them. Thanks for the answers, lots of good info. I have not seen very much from others with these campers. I think you may be setting the standard for mods on them. It must be a Jeep thing. I have been doing a bunch reading and research on solar setups. Definitely a variety of options to do it. When you mounted the exterior box where your solar connections go into the battery compartment, what did you use to seal around the box? With your solar panels mounted flat on the roof, do you notice a big difference throughout the day from when the sun is up high in the sky vs lower in the mornings/evenings? Once I get mine and I see what I have to work with, I may try and build some sort of mount that will allow me to flip the panels up at an angle in all 4 directions to point at the sun and still be able to lock down flat when traveling. Perhaps even something that just flips up one way and can rotate. Also thinking about doing a dual 6v battery setup vs a single 12v. Have to wait and see how much space there is in the battery compartment to work with. I think I am going to go with the Sunseeker awning option. It has a few optional add-ons that I can get that are better suited for what I want. My Jeep has a 3" Teraflex lift and sits level. I have had it loaded down pretty good and it did not seem to sag much. I think I will wait and see what it does when I actually have the trailer hooked up to it and decide if I should get a weight distribution hitch. I found a nice fold-able 6" thick queen memory foam mattress so I can fold it up and put some of the stuff I would normally carry in the Jeep back in the trailer to help offset some of the tongue weight. I was looking at your solar shower setup and storage tubes and will eventually do something similar to mine. I was thinking about using 6" PVC vs 4" just to have a little more capacity. Last edited by Razz on Sun Nov 19, 2017 12:30 pm, edited 2 times in total. Thanks for all the info and the videos. I've been following along (though brand new to this forum) as we are planning to purchase a pursue flyer as well. A few questions if you don't mind- and apologies as I know some of this had been touched upon here and elsewhere. Did you run the 12V for the fridge on the inside of the cabin, or under on the belly? We have not had a chance to see this units in person as of yet, and I was curious as to if there were any good channels under the belly to run wiring/hosing, such as another propane line to the back as I was thinking of setting up my indirect hot water shower back there. For the new lighting/electrical- did you just tap into the existing fuse block, or just run some inline fuses wired to the battery? I will be boondocking the majority of the time, so thanks for the extra info on the solar package you prepped. We'll have a RTT on the top of the trailer, so I was debating to use a flexible panel on the front. You mentioned you didn't wish to fish the wires from the roof of your setup, (and I get why you did what you did...), but was curious/imaging if I were to poke through in the front, I'd have no problem creating a chase down to the battery compartment within the built ins? Again, my guess is this is where all the wiring is for your porch and new interior lighting? Again, thanks for all the info and for taking the time to share with the rest of us. Hi Nibbs, I have been doing a bunch of reading/research on solar as I get ready to buy one of these trailers. I am no expert as I am learning all of this as I read about things others have done and what they have found along the way. A couple of things I have learned with the flexible solar panels is they are made essentially to use on the roofs of the bigger campers/RV's that have slightly rounded/contoured roofs that allow rain to run off. If they are flexed to much they get micro-cracks in the solar cells that will cause reduced efficiency and possibly damage them enough to make them useless. Its worth asking your local dealer/solar expert and/or manufacturer how much they can be flexed before this becomes a problem. Shadows from anything reduces solar performance as well. Just the small shadow from one of the roof rack bars can cause a big drop in performance. I read something the other day about a solar setup that someone installed on their 5th wheel camper, they have several 160 watt panels and a few smaller ones. As they were testing it, they noticed that one of the 160 watt panels was not producing very much power. It turned out they left the install instructions up there on the panel. Basically an 8"x11" sheet of paper caused about an 80% reduction in the amount of energy the 59"x26" panel could produce. So, even a small shadow from the roof rack can have an impact on them, not to mention an RTT. If you mount your panels on the front of the trailer you may be limiting yourself on how well they will work because the front of the trailer would always have to be pointed toward the sun for them to work best. Again, I am no expert but a portable solar kit may be a better option with your setup. Just some things to consider before you buy. Razz wrote: Hi Nibbs, I have been doing a bunch of reading/research on solar as I get ready to buy one of these trailers. I am no expert as I am learning all of this as I read about things others have done and what they have found along the way. Thanks for the thoughts- I've started looking into all of this as well. I was mostly doing a bit of research on the T@B's and the flex panel mounted to the front (their solution to permanent mount). I know it's not the most ideal, however, where I'll be, I'll either have mostly shade (so screwed any/either way), or be able to angle the trailer somewhat optimally. I've thought about the portable options, but won't be around all day to keep adjusting it, and more so, would then have them out in the open when I'm not around. I was thinking about fabricating some pseudo rack for a portable panel to have the appearance of a mounted unit, being able to remove it when ideal. While looking at inTech's video on YouTube I can across the video Gary did and it me, where I was already a member here, PERFECT! Time to read through this thread. 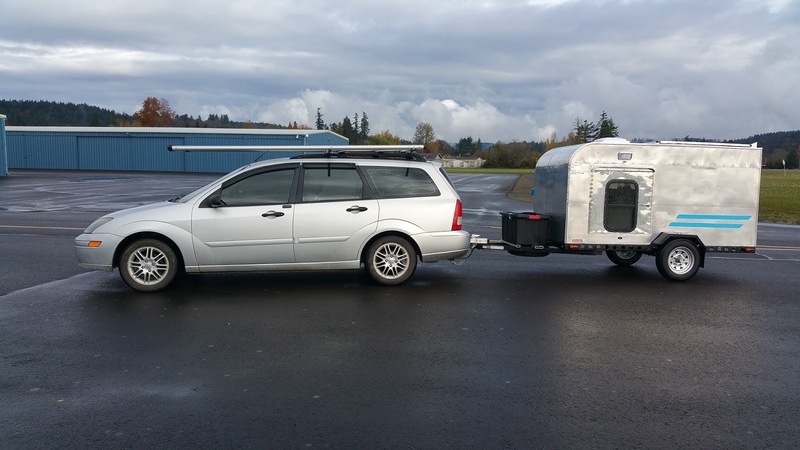 One of my customers has a race car trailer, 5th wheel built by inTech and I was impressed with the quality in it. Done reading through this thread so far, THANK YOU! There is another brand I was looking at that didn't have the galley like InTech does, but the rear door flips up to provide some shade/cover. I do need AC because of humidity (Ohio is like Virginia) and plan on having a Honda EU2000 to run through the night if needed. Having never slept on a memory foam mattress, and because of weight (260#) and sleep apnea, I HAVE to sleep on my stomach and getting comfortable is not easy. I have found an REI cot was perfect. I didn't toss or turn until I was awaken by track security. I was in the infield at Mid Ohio...and wasn't allowed there after dark. oops! Shower option is not needed, and likely nor is a sink...yet. I plan on staying at tracks (Like VIR and Pocono) during the SCCA races and then hit up KOA or state parks on the way back home...or towards the next race event. If I need a shower during midweek, I've no issues getting a room for a night or two. This little cabin near Watkin's Glen was perfect.....not my VW either. For one person? Too much! I made a couple more improvements to the Flyer recently. We finally did some truly "dry" camping and the weather was pretty chilly. Although we stayed warm inside, we decided it would be nice to have something to take the chill off before bed and in the morning. Found several people using "Little Buddy" heaters at the Overland Flea Market and had to get one for ourselves. Yes, we DO have a Carbon Monoxide and smoke detector installed on the ceiling of our Flyer. We don't intend to run this while we sleep, but I'm a strong advocate for safety equipment and taking appropriate precautions. Inaddition, we returned from the Flea Market on Black Friday. Before we left, we commented on several Rigid tool boxes that others were using for organizing their overland rigs. We were told that Home Depot had a sale going on... we took full advantage of the sale and did a little reorganizing in the back. I love how these stack and lock together. I bolted the bottom basket to the floor and the rest lock on top. No more straps to worry about.